This page contains spoilers relating to Ninjago: Masters of Spinjitzu: Hunted and Ninjago: Masters of Spinjitzu: Sons of Garmadon. Read on at your own risk. This article is about the Ninjago minifigure. For the Jurassic World minifigure, see Henry Wu. 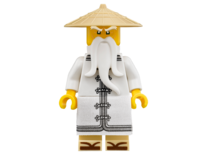 Wu, also known by Sensei Wu and Master Wu, and briefly as Evil Wu, Mysterious Baby, Teen Wu, and the Golden Dragon Master, is a Ninjago minifigure first released in January of 2011. He is a main character in Ninjago: Masters of Spinjitzu. In his second variation, Sensei once again wears a tan, straw hat and has an elderly face covered with a white beard. He wears a black torso with golden, Japanese characters running down the right side. He has a grey tie that extends down from his neck and around his chest to end at a tie at his hips. His legs are black, arms white, and hands yellow. As a microfigure, Wu is a smaller version of his first variation. He does not have accessories resembling his hat or beard. The beard is rather printed on his face and resembles his normal head without the beard piece with a much smaller, but still bushy, mustache and a tiny beard on his chin. His kimono design is mostly the same, but simplified. 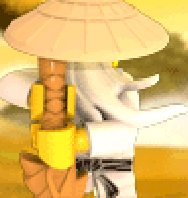 In the 2012 variation he wears a different white kimono, the same hat, except in Epic Dragon Battle and Temple of Light, where it was gold, the same face, and the same beard. The kimono now features a grey belt. The kimono is split between two grey sashes running up it with minute dragons on the left and red slashes on the right. In his Evil Wu variation he has the same hat as in previous variants, except in silver, and unprinted black legs. His beard is the same as before, but in black. His eyes are red, with metallic printing, to show that he is a cyborg. His torso is white, with black accents. He has a black belt printed on his torso. He has a black staff and handcuffs as accessories. 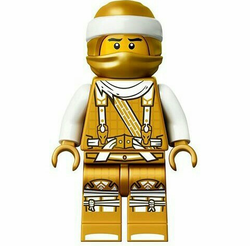 In LEGO Battles: Ninjago, Wu is a playable unit and appears with three variations. His first one resembles his first variation. He carries his staff and is hunched over. The second one also resembles his first variation, but he is now armed with the Sword of Fire, standing upright, and his legs and hands are more grey in colour. The third and final design is now based off of his black kimono. He once again carries his staff, but he is not hunched over. Wu is able to use Spinjitzu and "Fiery Touch" as attacks, but is also able to use "Spinjitzu Helping Hand" and "Army Heal". As a young boy Wu lived at a monastery with his father and his brother, Garmadon, who was also his best friend. During one of their duels, Garmadon disarmed Wu's katana and accidentally flung it over the monastery walls, since their father would be upset about it, Garmadon asked for Wu to go and retrieve the sword, only for Wu to refuse and get chided by Garmadon for it, saying to Wu "Never put off for tomorrow, what could be done today," before hopping the wall to get back his brother's sword for him, only for Garmadon to get bitten by The Great Devourer and infect him with its evil. Years later after their father passed away, Wu and Garmadon fought in the Serpentine War against the Anacondrai and Master Chen's cultists, and later the Time Twins Acronix and Krux. Later still, Wu managed to defeat Garmadon, now using his title of "Lord" granted by Chen, in a battle over The Four Golden Weapons of Spinjitzu. After defeating his brother, Sensei Wu hid each of the weapons and had a dragon of the corresponding element guard each one. He then created a map and gave it to a blacksmith who helped him defeat Garmadon to safe guard for him in case he died before the weapons required collecting. Shortly after the blacksmith passed away, Wu appeared again at his shop, called Four Weapons now run by his children, Kai and Nya and expressed disdain for the Samurai weapons that they are not suited for ninja. He then disappears. At this time, Garmadon, who had taken control of the Skulkin army over from Samukai, put into effect a plan to steal the weapons and the Skulkin attacked the shop, took the map, and kidnapped Nya. Wu reappeared to Kai and recruited him into his quartet of students, along with Jay, Zane, and Cole to help him rescue his sister. On their quest to retake the map and get the weapons before Samukai, Wu advises the ninja but acts as no immediate help until they reach the Fire Temple where Kai believes he sees Nya. Nya is actually an illusion created by Garmadon to lead Kai into the temple where the real Nya was being dangled perilously. Kai took the Sword of Fire and freed her, but they were attacked by Garmadon's shadow form. Wu rescued them and sacrificed himself and the Sword of Fire by going to the Underworld to allow Kai and Nya to escape. The ninja recruited the guardian dragons to rescue Wu and the weapons (the other three had been stolen by Samukai previously). They were successful, but not before Samukai was destroyed when he took all four weapons at once and created a vortex which Garmadon escaped through. Wu insists that the ninja keep training for Garmadon's return when Nya informs them that he indeed has. This turns out to be partly false as Wu's nephew, Lloyd Garmadon is terrorizing the village. After defeating Lloyd, the ninja discovered a scroll that had fallen from Wu's bag that told the prophecy of a Green Ninja. To gain power, Lloyd began freeing the different Serpentine tribes who could only be repelled by Wu's magic flute. Lloyd also defected to his uncle's side after reading Never Trust a Snake and Wu uses him to teach the ninja about the destructive power of rumours. When Lloyd was kidnapped by the serpentine in Pythor's quest to free The Great Devourour, the now four-armed Lord Garmadon joins forces with Wu and the ninja to rescue his son. After Lloyd is rescued, he is revealed to be the green ninja of the prophecy, but the ninja and Samurai X are captured by the Serpentine before they were rescued by the Garmadons and the Skulkin. To try and prevent Pythor's plan from succeeding, Wu took the Fang Blades, which had been acquired by his students previously, to a volcano to destroy them. However, Pythor sabotages Destiny's Bounty and Wu falls overboard. The ninja rescue him, but Pythor collects the blades while they are distracted. Wu, Samurai X, and the ninja go in pursuit of the Serpentine to rescue the Fang Blades and after Cole defeats Skales Wu goes after the only Serpentine left on the bus, Pythor. However, the Mailman bicycling in front of the bus causes it to take a sharp turn and flip. Pythor escapes and releases The Great Devourer, but not before Wu can put Pythor in its path, Wu again sacrificed himself and both were devoured. After Garmadons, Nya, and the ninja defeat the monster, Wu is found to be alive, though Pythor, Lord Garmadon, and The Four Weapons (which were used by Garmadon to defeat The Great Devourer) are nowhere to be found. During the clean-up of Ninjago City, Wu informed the original four ninja that it is now there duty to train Lloyd for the destined battle between himself and his father. When Lord Garmadon does return, once again on the opposing side and allied with the Serpentine, he uses a Megaweapon created from the four golden ones to create a portal to go back in time, though Kai, Zane, Cole, and Jay follow him. They meet the past's Sensei Wu and informed him of what time they are from and why they are there. Eventually, several souvenirs in the museum are brought to life by the venom Great Devourer, and Wu and the ninja go to investigate. There, he encounters Misako, who is revealed to be Lloyd's mother. Soon afterwards Wu volunteers to help Misako with sort through her research on the green ninja prophecy, and it is revealed that they had a romantic past together when Misako says, "I should have chosen you". On the same day as this occurs, the Devourers venom reawakens the entire Stone Army underneath the city. The army begins attacking the city, and Wu, Misako, and the ninja work together to protect the citizens. During the disaster, Misako loses her research and must leave safety to try and retrieve them. Sensei Wu rushes off to save her, and they successfully retrieve the notes, but they are soon surrounded by Stone Warriors. They eventually jump out of the building they were in, but are saved by the Destiny's Bounty. They set sail to the Dark Island, but the Destiny's Bounty's thrusters are damaged en route. They land on a small island where it is revealed that Dr. Julien was held, and he repairs their thrusters, enabling them to continue their voyage. At the Dark Island, Wu assists the ninja on their various missions, but mainly stays near the camp. He is, however, present when the ninja attempt to return the Helmet of Shadows to its pedestal to stop the final battle, but the group fails and Nya is separated from the rest of the group, who fall when a portion of the cliff they were standing on falls into the water. Kai and Jay want to rescue Nya, but Wu states that preparing for the final battle should be their priority, and that they can rescue Nya later. Soon afterwards, they find out about Garmadon's Super Weapon and track it to the Dark Island's coast. Their, they discover the Overlord's plan to fire Dark Matter to Ninjago to alter "the balance" and make it so he is able to cross over there. He also takes over Garmadon's body and fights Lloyd. In the aftermath, Lloyd breaks his leg and fails to stop the Overlord, who keeps the group alive but crosses over to Ninjago, leaving them behind. The group sit on the beach, beginning to admit defeat, but Lloyd rallies them on and the Falcon informs them of another secret hidden in the Temple of Light. There, they find the Golden Robot, and they use this as well as the Ultra Dragon to escape the Dark Island and reach Ninjago. They proceed to fight the Stone Warriors, and Lloyd succeeds in defeating the Overlord. Garmadon is returned to normal in the process, and he reunites with is family. The ninjas realize that their mission is over for the time being, but inform Wu that they'll always be ninjas. Many months later, Wu has opened "Sensei Wu's Youth Academy." When the school goes on a field trip to Borg Industries, his ninja acquire the Techno Blades from Cyrus Borg in order to defeat the Overlord virus. Wu aids the ninja in protecting the people from the Overlord's forces. Wu is then captured while playing out his plan to get Lloyd and the Techno Blades out of the city. The Overlord gains access to Wu's memories to find out where the ninja took the Techno Blades. Eventually, the Ninja managed to use their elemental powers to create a new spaceship home while the Nindroids returned with the Golden Weapons and melted them down to create a Golden Mech. Garmadon, Wu, Nya, and P.I.X.A.L. sent the Ninja their vehicles as they arrived back in Ninjago and together they all charged into New Ninjago City where the Overlord was wrecking havoc. Watching the pill fly towards the Overlord. Some time later, the Ninja left Ninjago Island with Garmadon to participate in Master Chen's Tournament of Elements. Wu stayed on Ninjago and helped Nya track them down. The Ninja later returned on their Elemental Dragons and Chen unexpectedly revealed that Garmadon had married Misako only because he had signed Wu's own love letter, causing a rift between the two brothers. Although Wu and Misako forgave Garmadon, the older brother had Wu and Lloyd banish him the Cursed Realm, seemingly to never see him again. Wu then opened the tea shop "Steep Wisdom" on the site of Garmadon's old monastery, hoping to finally settle down, but soon sold it to Cyrus Borg when his former student Morro returned as a ghost, having escaped the Cursed Realm. Wu then began to train Nya to become the Water Ninja and played a major part in the final battle against Morro and his master, the Preeminent. Although he offered to save Morro from his ultimate death, the Master of Wind, having had a change of heart, declined and finally died. Although Nadakhan was able to trap Wu in the Teapot of Tyrahn and later the Djinn Blade as his second victim (second only after Clouse), the wish made by Jay prevented this event from occuring. During the Day of the Departed, Wu and the Ninja were warned by Morro about Yang's plan to become human again. Wu soon faced another pair of old enemies, the Time Twins Acronix and Krux. Wu recklessly attempted to defeat Acronix in one-to-one combat but was hit by the Time Punch, causing him to age rapidly. He was eventually saved by the effects of the Reversal Time Blade but was lost to time to keep Acronix and Krux occupied. He eventually resurfaced in the form of a mysterious baby and was discovered by Misako and later the Sons of Garmadon. Wu was soon rescued from the Sons of Garmadon by Cole, who had no idea that the mysterious infant was his missing mentor. The baby showed incredible intelligence and prowess, growing rapidly and being able to use tools and drink tea. After uttering the phrase, "Ninja never quit," the Ninja realized who the baby really was. In the Realm of the Oni and Dragon, Wu grew from a toddler to a young child to a white-haired, mustachioed, teenager and became the "Golden Dragon Master" by donning his father's old armor and taming the Firstbourne Dragon. 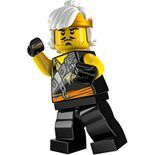 Wu then helped Lloyd confront and defeat the resurrected evil Lord Garmadon and eventually returned to his proper age and appearance. He is voiced by Paul Dobson, who also played the voice for Whenua in the second and third BIONICLE movies. He later voiced Rattla and Falcon in the first season of Ninjago: Masters of Spinjitzu, and later on, Acidicus, Jacob Pevsner, Ghoultar, Fenwick, and Flintlocke. Sensei Wu's black robes have symbols that protect him from evil. They aided him in defeating Lord Garmadon prior to his banishment to the Underworld. He gains a new kimono in the 2012 wave. However, Wu keeps his old Kimono in the series and never gains a new one. Under his rice hat is a small black cap, and a photo of him, Misako and Garmadon when they were younger. He appears to still have strong feelings for Misako throughout the series. This is a description taken from LEGO.com. Please do not modify it. Sensei Wu is a wise, old Spinjitzu Master. How old is he? Only his brother, the evil Lord Garmadon knows, and I'm not gonna ask him. Their father created Ninjago, and to help protect it, Wu is training four young ninjas in Spinjitzu. He is very strong… sometimes he strikes with his staff, other times, he uses his wisdom. "Rise of the Great Devourer"
"The Day of the Great Devourer"
"The Day Ninjago Stood Still"
"Rise of the Spinjitzu Master"
"The Art of the Silent Fist"
"Curse of the Golden Master"
"The Day of the Dragon"
"The Greatest Fear of All"
"The Temple on Haunted Hill"
"A Line in the Sand"
"Out of the Fire and Into the Boiling Sea"
"How to Build a Dragon"
LEGO Club Magazine Issue 1 2011 - Lessons of the Dojo!, Spinning to Win! 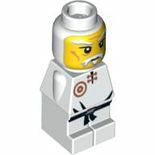 Sensei Wu as he appeared in 55000 LEGO Universe. He has been moved in the game to a different location since. Wu leading the Elemental Alliance into battle during the Serpentine Wars. This page was last edited on 24 March 2019, at 20:56.